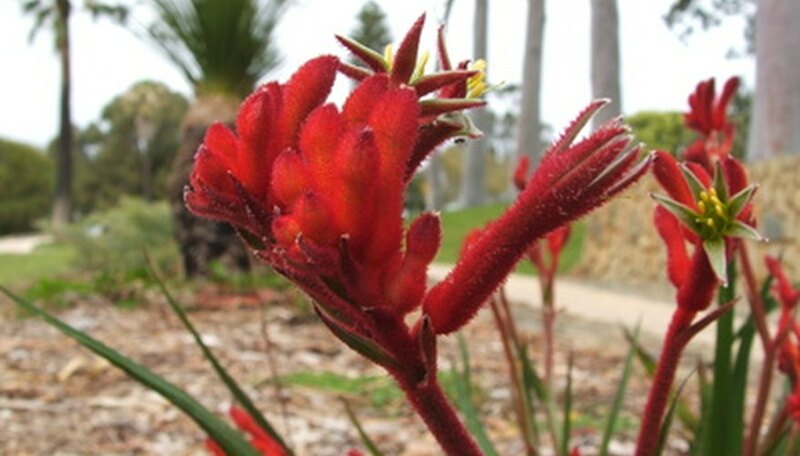 The evergreen kangaroo paw plant (Anigozanthos), native to western Australia, is highly valued as a perennial landscape specimen for the home garden. 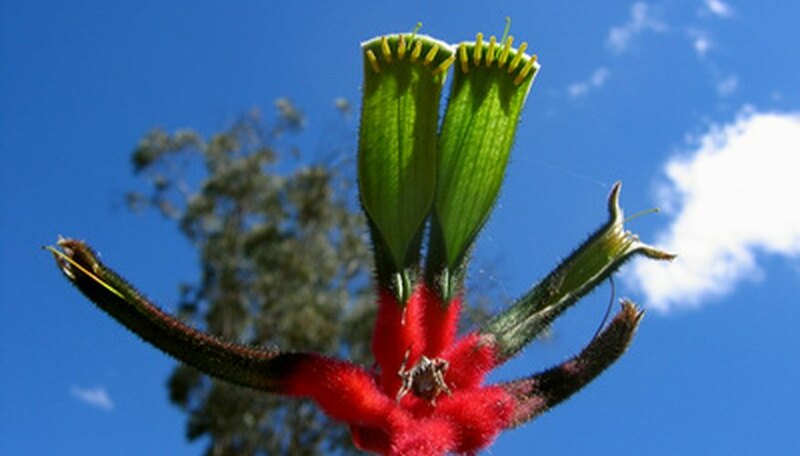 Eleven species of kangaroo paw plants exist. The plant produces unique 4-inch furry green, red, pink, white, purple, orange or yellow blossoms with red stems. The kangaroo paw plant requires tropical and sub-tropical weather conditions in zones 9 to 11. It will not tolerate a temperature dip below 40 degrees Fahrenheit. The kangaroo paw plant grows throughout western Australia. It flourishes around Lake Muir and along the Murchison River. The plant grows well in arid regions with dry sandy soil in its native habitat but it can be grown widely throughout the southern United States in areas that are hot and humid. Each blossom is adorned in tiny, fine hairs that give the flower a furry appearance. The hairs act as a protection mechanism for the plant. Each small hair has an unpleasant flavor that easily sticks into any animal's mouth that is unfortunate enough to taste the unpalatable plant. The hairs also help the plant conserve tiny droplets of rain water in the desert regions where it grows. Birds enjoy feeding on the honey substance that the flowers produce. The birds help to pollinate the flower by spreading its pollen from plant to plant. To consume the honey the birds must insert their heads into the flowers, during which pollen is directly deposited onto the bird's head to be carried to another plant within the species, according to the Australian National Botanic Gardens. Flowers are produced from August to October, followed by seeds. The kangaroo paw plant is easily propagated using its tiny seeds. Young plants blossom at only 1 year of age when propagated from seed. Germinate seeds indoors in pots for best success. Choose a location in full sunlight such as a sunny window. The seeds germinate within one month of planting. When fully grown the kangaroo paw plant will easily attain a height of 2 to 10 feet with a spread of up to 4 feet depending on the cultivar. The plant is relatively disease-free but is susceptible to fungal infections when the foliage is allowed to remain wet. Avoid overhead watering so the foliage remains dry. Growing in a sunny location with ample air circulation around the plants also helps to prevent fungal infections.